Over the past couple of years, I’ve enjoyed a fruitful association with Voice Lab – the department that deals with choirs and community singing events at London’s Royal Festival Hall. This mutually beneficial relationship started when I was invited to facilitate the presentation of one of the department’s regular events, The Big Sing, featuring the Chorus of the Orchestre Symphonique de Kimbanguiste, from Kinshasa, Democratic Republic of Congo. After meeting the choristers in Manchester, I led a session that introduced the chorus and some of its repertoire to a huge audience at the Royal Festival Hall, on a sunny Saturday morning. After that exhilarating experience, I was asked to lead a Beyond the Bass Line session for Voice Lab. Beyond the Bass Line is a monthly workshop event aimed at encouraging men to sing, as part of a group and as soloists. In many choirs, the male voices in the choral repertoire are used to support the vocal lines sung by women, especially sopranos. On this occasion, the session I led had additional significance, as it was part of the Southbank Centre’s Africa Utopia season. I designed a workshop that comprised of two parts. In the first half, participants would sing folkloric songs from diverse parts of Africa and in the second half they would sing some songs that I composed for Threshold – an African music theatre show, inspired by The Palm Wine Drinkard – a classic novel, written in the 1950s by the Nigerian author, Amos Tutuola. The workshop was well attended, with up to 30 participants from a wide range of backgrounds and heritages. The men engaged fulsomely with the repertoire – the folklore and the music that I composed. I met some keen amateur singers of African and Caribbean heritage who have expressed interest in being involved in Transculturalvisions’s Singing Cultures project. In the feedback received after the workshop, I was led to understand that there is a gap in the choral singing sector for male voice choirs to sing African derived repertoire. Participants wanted me to do more. As a result of this, I invited several of them to sing in a choir that I set up for a local Christian Fellowship’s Carol Service last Christmas. The service was very successful. I’m hoping we can also attract several female singers from the Southbank Centre’s Voice Lab network to join us in our Singing Cultures project. Juwon is a classical musician & composer of Nigerian heritage. His compositions have been commissioned by the RSC; BBC; Union Dance; and Southbank Centre. 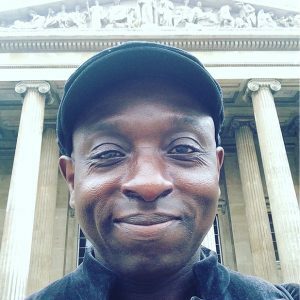 Juwon has a track record of devising and leading community music projects and conducting choirs. How can you leave feedback? We would love to hear your comments and views. You can do this by leaving a message below.